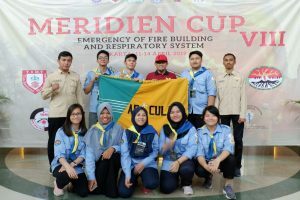 UNAIR NEWS – Aesculap Environmental Study Group Faculty of Medicine, Universitas Airlangga (KPLA FK UNAIR) won 3rd place in Meridien Cup VIII 2019 competition in Jakarta on Sunday, April 14. 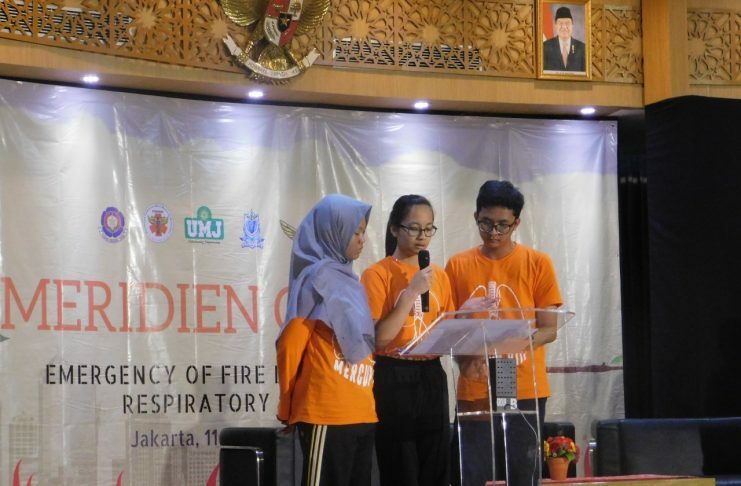 The national competition was held by Muhammadiyah Medical Response Team in Disaster and Human Being (TBM Meridien) FK Universitas Muhammadiyah, Jakarta (UMJ). Unair team won competition in the field of Medical Competition of Emergency and Traumatology (MCET). The team consists of Margaret Ayu Caroline, Fariza Nur Aini, and M. Helmi Imaduddin. Sharing her experience, Margaret Ayu Caroline explained before each team had a workshop. During the competition, she accidently break the tools used in the competition because she felt awkward. This awkward feeling caused by material taught at workshop was not the same in the competition. With confidence, the team tried give their best of the competition. “At first you were wrong, in the end you understood and did it right, unfortunately you broke the tools.” said one of the judges in the competition. From various experiences, Caroline was very grateful that she won Meridien Cup. Not only the competition, various evaluations from the jury motivated her to develop KPLA. The development includes KPLA medical cadre by reviewing medical curriculum. The study was conducted with seniors to upgrade their knowledge. In addition, she wanted to help the community in natural disaster area. This year, KPLA will collaborate with Airlangga Warrior Floating Hospital. In addition, the prizes obtained were used to purchase medical equipment for disaster units. Thus, the tool will be used for training and medical jobs. “I think the interesting thing about the competition yesterday was FK UNAIR character, especially KPLA,” she explained. Seeing KPLA still have time to joke around while the other groups were busy learning and managing strategies during break time. KPLA received appreciation from other groups for successfully entering the final round and winning. UNAIR NEWS – In international event, student from Faculty of Law (FH) Universitas Airlangga (UNAIR) team representing Indonesia in Philip C. Jessup International Law Moot Court Competition 2019 on March, 31 – April 7 at Washinton D.C United States. FH UNAIR TEAM reached 13th highest ranking out of 130 countries from all over the world. This achievement was a remarkable achievement by FH UNAIR student who joined the international event of JESSUP competition for the second time. Dr. Intan Soeparna as the coach of FESS UNAIR JESSUP team explained Phillip C. Jessup. The event is the largest international pseudo judicial competition in the world. In addition, more than 680 universities from all over the world attended the event. Before the event being held, there was a national selection to represent the country. This year case is “Conflict over natural resources between two countries “. At Preliminary Round, Unair team defeated delegates from Albania, Iran, China and Chile with the highest score. Unair team succeeded in top 32 and managed to beat Australia team (Queensland University) which was the winner team last year.” she explained. “In top 16” Octo – final rounds “, UNAIR team faced American team (Yale University) and had to accept defeat. For the first time, Unair team entered top 16 and ranked 13th out of 130 countries.” she added. 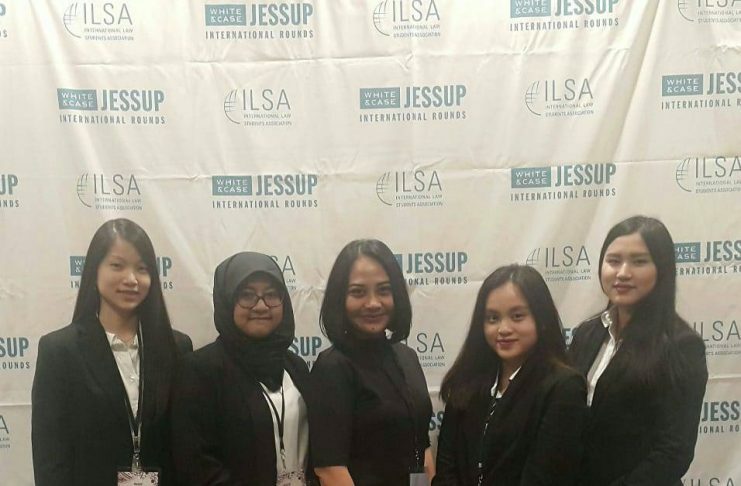 The UNAIR delegation competed in JESSUP 2019 consisted of four students Regine Wiranata (2016) Megawati Widjaja (2016), Shofy Suma Nisrina (2016), Thesalonica Shinta (2017) and Dr. Intan Soeparna as a coach. In the competition, UNAIR represented Indonesia twice in a row. Moreover, the competition was organized by International Law Students’ Association (ILSA) which consists of two stages, namely National Round and International Round. This year, Indonesia National Round held on 2-3 February 2019. In addition, Universitas Airlangga team and Universitas Indonesia (UI) represent Indonesia at JESSUP event. UNAIR NEWS – International Medical School, Management and Science University (MSU) visited Universitas Airlangga’s Faculty of Public Health (FKM) on Monday, April 16, 2019. The student visit was a part of collaboration between the two universities that have been running since 2018. There were at least twenty two MSU students who came and were accompanied by two lecturers. In this visit, the delegation from MSU specifically studied Pulmonary Tuberculosis to END TB: Case Study in Indonesia with dr. M. Atoillah Isfandiari, M.Kes, a lecturer of FKM UNAIR. Dr. Nur Ezza Fazleen Mohd Fathil, assistant lecturer from MSU also had the opportunity to give a lecture on the same topic regarding cases in Malaysia to FKM UNAIR’s fourth semester students. The topic was chosen to commemorate World Tuberculosis Day on March 24, 2019. The activity was ended with cultural performances from both parties. 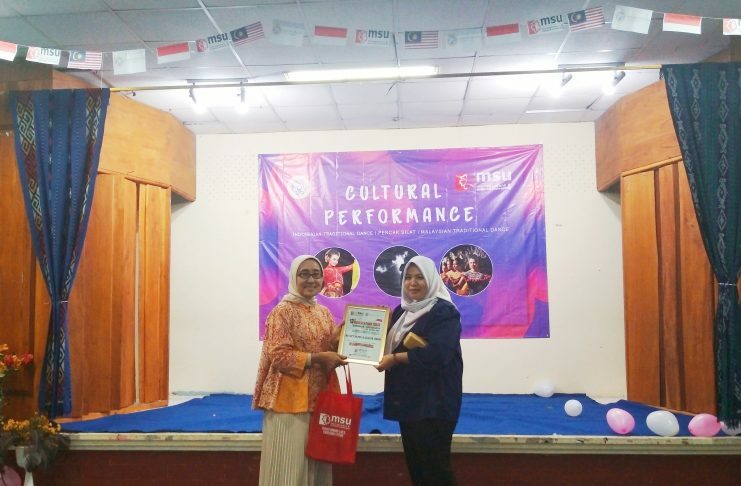 Several delegates from MSU performed two dances and a flash mob while representatives from FKM UNAIR performed pencak silat and Sparkling Surabaya dance. Dr. dr. Santi Martini, M.Kes, Vice Dean I of FKM UNAIR explained that cooperation between the two universities had been done since 2018. In this second year, several activities of collaboration were student visits and student exchanges. “There were 15 MSU students coming here in July or August. And we will also send around 15 students to study there (MSU, ed) as well, “explained Dr. Santi. In addition to academic activities, Dr. Santi hoped there will be joint research with MSU. And if possible, such cooperation can develop into joint supervision or even double degree program. 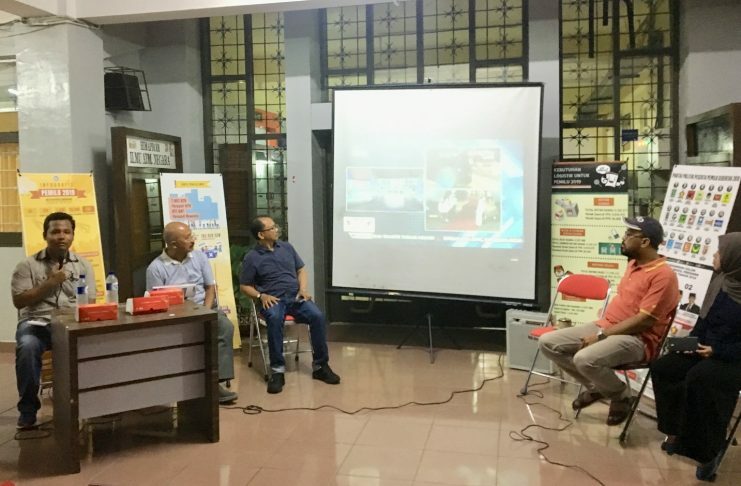 UNAIR NEWS – The community enthusiasm, especially for students participated in eSports was the reason for Student Executive Board (BEM) Faculty Vocational Studies Student (FV) Universitas Airlangga (UNAIR) to include eSports in 2019 FV Dean Cup. 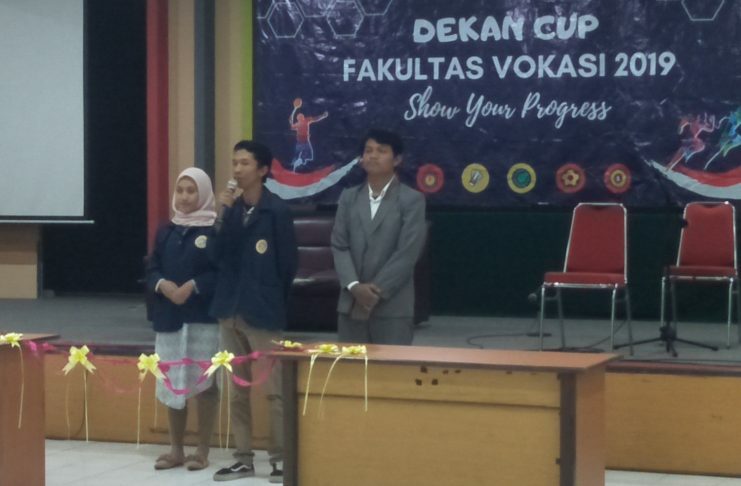 Explained by Rifqi Abiyyu G as Head of the event at opening ceremony FV Cup Dean at FV Hall in UNAIR April, 15. “The tag line that we carried out on Dean Cup activity brought something new related to the rapid change of technology, namely eSport. Besides that, we are also adjusting the development of the times where eSports is currently one of the sports that are popular among milennial “said Abiyyu. In Cup Dean, BEM FV competes 3 types of eSports. Among other things, Mobile Legends, Player Unknown Battlegrounds (PUBG), and Pro Evolution Soccer (PES). The three games gained very large interest from FV UNAIR students. This can be seen from the large number of registrants who register more than one team. “Because of the high enthusiasm, we as organizers prepared qualified jury in the field of eSports. On the other hand, we choosed a person in charge who already has experience in eSports. “Hopefully, eSports can become a prestigious sports branch besides soccer, volleyball and table tennis,” he added. In the end of the interview, Aditya Nurjulian who served as Head of BEM FV UNAIR explained that the main purpose of Dean Cup was to foster a sense of unity among students, especially FV UNAIR students. “This Dean Cup was an event to strengthen the relation with another student. Thus, the activity aims to foster a sense of kinship between Hima, “Aditya explained. UNAIR NEWS – Studies Outside Main Campus (PSDKU) of Universitas Airlangga has a Community of Interest and Talent (Komikat) specifically for personal development, namely Munwa Pribadi. The organization stands for Student Community Self Development and Personality. This year, Munwa Pribadi held a talent search event for PSDKU students of “Campus Ambassador”. The activity was a series of commemoration of Kartini Day organized by Head of Private Munwa. The selection of campus ambassadors was attended by representatives from all faculties in PSDKU Universitas Airlangga in Banyuwangi. After going through a tough selection, the peak on March 19 was announced by 12 finalists who had escaped. Met by UNAIR NEWS on March 13, Rista Meilia Pratiwi as head executive explained the series of events and debriefing of the material to be obtained by 12 campus ambassador finalists. 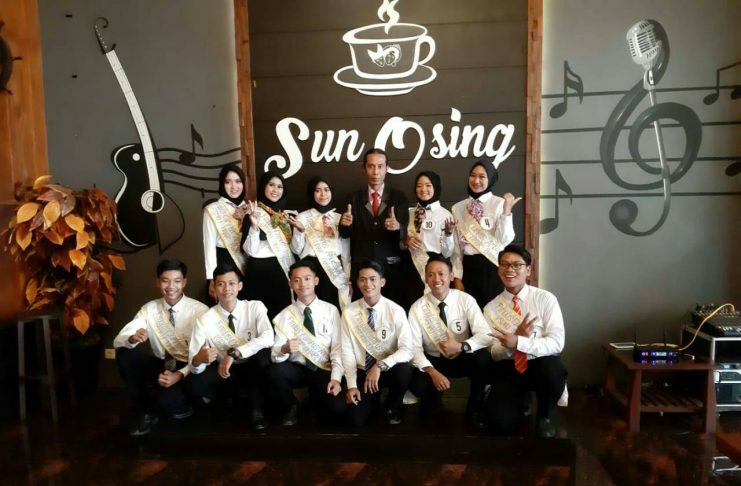 In addition to table manner, the finalists were also provided with material about UNAIR, public speaking, and beauty and handsome classes. “Campus ambassador will be representatives of PSDKU Universitas Airlangga. They need to be equipped with materials to support their knowledge.” explained the student who familiarly called Rista. Before the event, 12 finalists participated in the pre quarantine activity. It was held in one of restaurants in Banyuwangi. In there, all of finalists had opportunity to learn about table manner. The material was delivered by one of personality coach in Banyuwangi, Sukir Kadek. Regarding the material, added Rista, participants were given material about French style of table manner, such as procedures for eating appetizer, main course, and dessert. In addition, the procedure for holding a glass and a different way of drinking through a glass. “The finalist’s enthusiasm were high, it can be seen in material presentation and they asked many questions to the presenters.” he said. In the end, Rista also said the pre-quarantine activity was closed with the delivery of napkin material. Furthermore, the finalists had the opportunity to show their skills in making napkin. “Campus ambassador is expected to be a branding event for PSDKU Universitas Airlangga in Banyuwangi ” concluded the VI semester student from Faculty of Economics and Business. UNAIR NEWS – The modern world creates more various jobs. Every individual is required to have skills in communication in order to build a network (Networking). 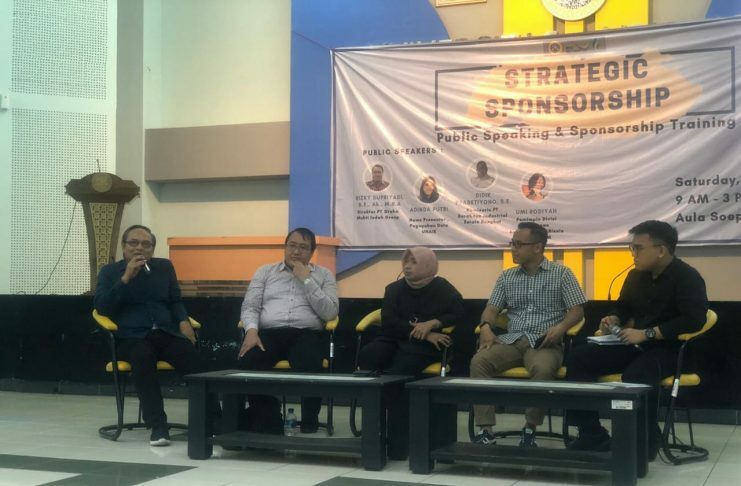 As a response, the Department of Foreign Affairs of Student Executive Body (BEM) Faculty of Economics and Business (FEB) Universitas Airlangga (UNAIR) held a discussion activity on public speaking. The activity was held on Saturday, April 13, 2019 in the Soepoyo Hall of FEB UNAIR. There was Adinda Putri, A. Md (TVRI East Java Presenter and UNAIR Ambassador Association) as the speaker. Adinda explained the steps that need to be done by someone to become a public speaker. The three main steps are vocal training, speech style training and extensive knowledge. First, the practice of emphasizing the sounds of a, i, u, e, and o is important to learn so that individuals are able to pronounce words correctly. Reciting the right words makes the content of the conversation easily understood by the listener. Second, the communication style that should be used in public speaking. It should be followed with hand movements, for example, to create an aesthetic value for the audience. “This speech style exercise can be done alone in front of a mirror. Watch how the look on the face and hand movements when talking in front of the mirror, ” she added. Then the last is broad knowledge. The wider the knowledge possessed, it will increase confidence when speaking in public and it can increase the audience’s confidence in the speaker. UNAIR NEWS – 2019 simultaneous elections are just days away. The fifth presidential debate will become a benchmark in determining the future votes. Attending at the debate, Rector of Universitas Airlangga (UNAIR) Prof. Dr. H. Mohammad Nasih, S.E., MT., Ak., CMA., as the panelist coordinator for the Fifth Presidential Debate 2019. As a response, Student Executive Board (BEM) of Faculty of Social and Political Sciences and UNAIR Faculty of Economics and Business (FEB), together with UNAIR’s Political Science Student Association (Himapol), collaborated to watch the debate live and hold a discussion forum. The activity was held on Saturday, April 13, 2019 in a park behind FISIP UNAIR. The discussion was attended by speakers from academics, including Head of Study and Strategic Action Department BEM FEB UNAIR, Siti Nur Umami, and two UNAIR Political Sciences Lecturers Dr. Kris Nugroho, Drs., M.A., and Ucu Martanto S.IP., MA. There were also guests at the event, UNAIR FISIP Professor, Prof. Drs. Ramlan Surbakti, M.A., Ph.D. In his remarks, Prof. Ramlan stated that he is longing for appropriate campus atmosphere and students’ works. Related to the previous debate, Prof. Ramlan also gave a bit of criticism. The discussion forum was divided into three sessions, pre-debate discussion, respondent’s responses after a debate session, and post-debate discussion. The fifth presidential debate, indeed, was focused on economic aspects. “For voters who are still undecided or who have a choice, after this last debate, they have to make their choice from the candidate pairs,” said Ucu. Not much different, according to Kris, this debate was the last moment as the voters must determine to go to the ballot box next April 17. Although many voters already have their political choices, this fifth debate can be taken into their consideration as well. “Before this debate, many had strong political choices and opinions, but that choice could change tonight,” he said. Meanwhile, Umami, as an FEB student who understands economics, explained that all programs offered by the two candidates may be able to improve the welfare of the community. And the elected president’s policy program will be able to be escorted by existing elements, not just the president. 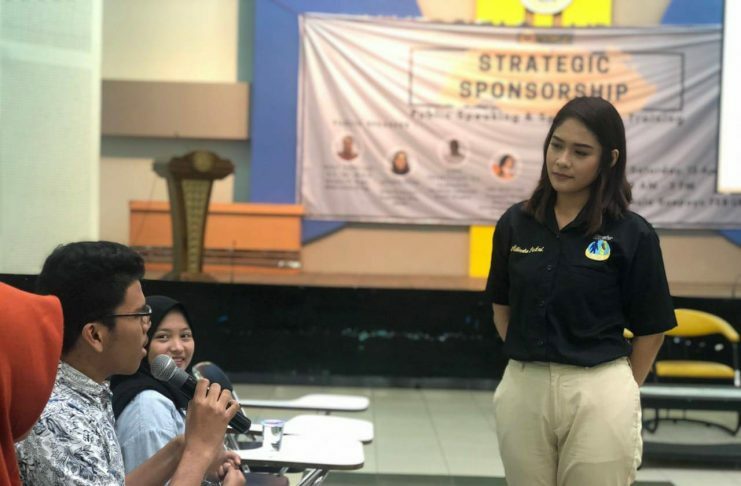 UNAIR NEWS – Department of Foreign Affairs, Universitas Airlangga Student Executive Body (BEM) held a strategic sponsorship discussion on Saturday, April 13, 2019 in Soepoyo Hall, FEB UNAIR. The activity was inspired by many activities of student organizations that needed funding support activities at FEB UNAIR. There were representatives from fifteen student organizations (Ormawa) at FEB UNAIR. The speakers were Rizky Supriyadi, S.E., Ak., M.B.A. (Director of PT Graha Mukti Indah Group), Didik Prasetiyono, S.E. (Commissioner of PT Surabaya Industrial Estate Rungkut), and Umi Rodiyah S.E. (Leader of Institutional & Business Relations Division JATIM Bank). Regarding the procedure for obtaining sponsorship funds, the three speakers explained important points that must be considered, time of the activity, the concept / content of the activity and the feedback or compensation that the sponsors will receive. First, the time of sponsorship request. The right time to apply for sponsorship funds is two months before the activity is held so the sponsors have sufficient time to consider the funds submitted. Second, the concept / content of the activity. The concept of the activity must be interesting, that it ensures there will be great participation. Third, compensation obtained by the sponsors. Such compensation greatly determines the continuity of cooperation between sponsors and event organizers. UNAIR NEWS – As a part of health education event, UNAIR Hospital has just launched a book on comprehensive and up-to-date management of HIV / AIDS cases, The Latest, Comprehensive and Multidisciplinary HIV / AIDS Management. 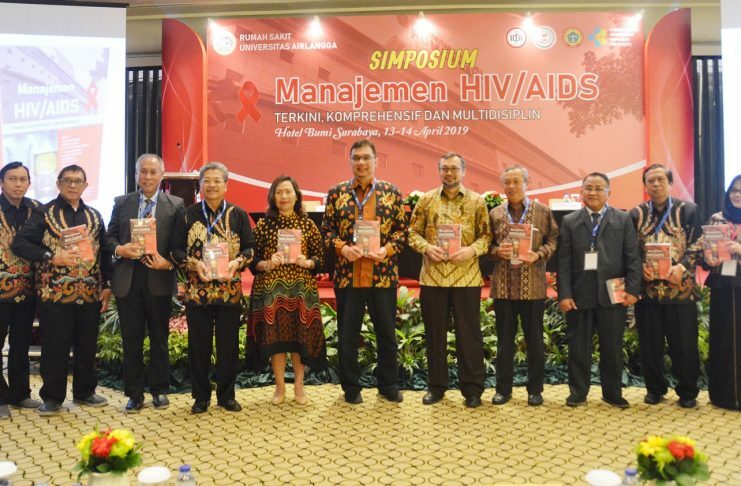 The book launching was carried out on the first day of a Symposium on HIV / AIDS Management on Saturday, April 13, 2019 at Isyana & Rajasa Ballroom, Bumi Surabaya City Resort. The book was written by 71 contributors and lecturers of Faculty of Medicine (FK) UNAIR. However, besides doctors, pharmacists and nurses were also involved in the book production. The aim of this book release is to achieve a comprehensive management of HIV / AIDS. “We make this book as an information for professionals, especially those who have limited access, such as health professionals outside Java, “ explained Cahyo Wibisono Nugroho, dr., Sp. PD. FINASIM, chief executive of symposium and book launching. “Because, this one book can provide education from various fields of health so health professionals with limited access can still provide best services to patients,” Cahyo added. In the field, various professionals cannot work alone. Therefore, UNAIR Hospital considers it necessary to unite the vision and mission of health professionals. Therefore, the patient services, especially to HIV patients, can be carried out optimally. One form of unifying the vision and mission is through the book. The book brings advantages. It is the only book in Indonesia that addresses HIV / AIDS management from various fields. It is a systematic research and references based on Evidence Based Medicine (EBM) rather than Testimonial Based Medicine (TBM). “There are many books focuses on HIV / AIDS material. However, this one is comprehensive where we discuss from various sides. This book is the only one in Indonesia, “Cahyo said. In addition to explaining general information on HIV / AIDS, the contents of the book also include management of HIV / AIDS from various fields such as in the fields of internal medicine, surgery, dermatology and venereology, lung, heart and blood vessels, neurology, ophthalmology, ENT health, child health, anesthesia and reanimation, and mental health sciences. It includes an explanation on supportive therapy and exam for HIV / AIDS as well as additional material on HIV / AIDS. “This book explains everything, so we hope this book is enough to provide an optimal management to patients of HIV / AIDS,” Cahyo said. The discussion about the book was carried out by various fields and according to their respective expertise. So, hopefully with the book, health services in Indonesia will be much better. So even through there are no medical specialists in remote areas, maximum health services can still be implemented. UNAIR NEWS – Joining student exchange is a dream and a great opportunity for students. No exception for Riyantita Tunjung, one of the many students at Universitas Airlangga who had an opportunity to be student exchange participants. Spending 25 days in Egypt, Riyantita shared her story with UNAIR NEWS team. Riyantita participated in student exchanges through a program of International Pharmaceutical Students Federation (IPSF). Through this program, she had an opportunity to study pharmacy at Imbabah Hospital and Pharma International Pharmaceutical Industries (PICO). 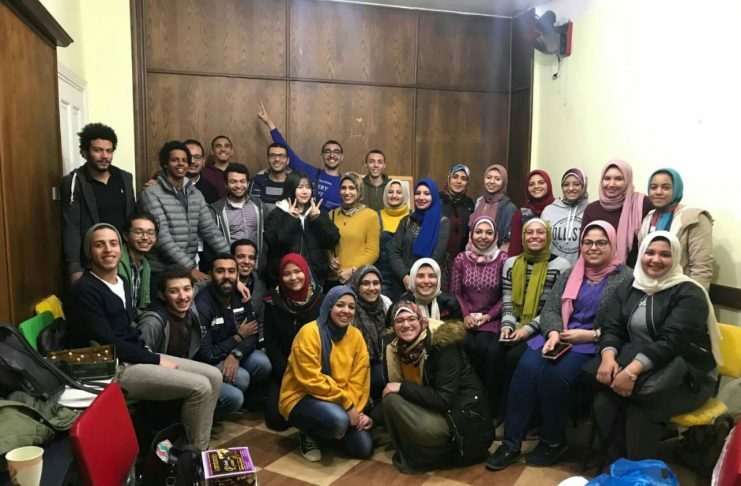 The student of Faculty of Pharmacy batch 2014 choosed Egypt as her destination not without a reason. Besides being an international standard pharmaceutical industry, Egypt also has interesting history and culture. That was Riyantita’s intention to join exchange program. “Egypt is rich with history, starting from pyramids, mummies, and so on. Besides wanting to learn about pharmacy, I also want to learn about Egypt culture, “he said. In Egypt, Riyantita claimed to get a lot of knowledge and experience, especially in pharmacy. She also experienced working as a pharmacist in industry and hospitals. “At Imbabah Hospital, I learned a lot about the role of a pharmacist in a hospital. Starting from making visits to each patient, ensuring the availability of drugs in the warehouse and installation.” she said. “For the industry, I was invited in company tour to see every process in there. I got a lot of knowledge about the pharmaceutical industry from production stage to marketing method. I also had time to participate in product dissemination to several places, “he continued. Not only knowledge about pharmacy that impressed Riyantita. There were several unique things about Egypt. One of them was a sense of tolerance and high nationalism owned by the people in there. “The memorable thing from Egypt is a very high sense of tolerance among people. They respect each other very much and they appreciate the achievements made by their citizens, ” she recalled. Not only sharing experiences, Riyantita also invited other students to follow her footsteps. For her, nothing is impossible. Keep trying and praying.